Citidel Investment App (sometimes mistaken as Citadel Investment App) developed by the alleged owner, Dr. Kent Grifly promises to make you money without risks and investments, but don’t be fooled. Citidel Investment App is a scam. Read our in-depth Citidel Investment App review before you throw your money away! Citidel Investment App is promising profits without any investment? You’ll soon realize that it is just a fake promise. That headline at the beginning of the video is just to catch your attention and make you watch the rest of it. It is within the video where the presenter tries to brainwash you and convince you that Citidel Investment App is legitimate. If you were quite convinced that Citidel Investment App is a real deal, sorry to burst your bubble. Because we are going to do some scam busting right now. Within the sales video of Citidel Investment App, the presenter showed a short footage of Dr. Kent Grifly talking about the software in a conference. The screen clearly has Citidel’s logo displayed on it, and it looked like a pretty grand event. However, we discovered that it was actually just a photoshopped logo, and the original stock video had a blank screen. The original video was a stock video, where Jonathan Ross (the real speaker in the video) was standing near a white screen and reads a report in Moscow, Russia on October 10, 2010. The footage can be purchase for $49 from videoblocks.com. 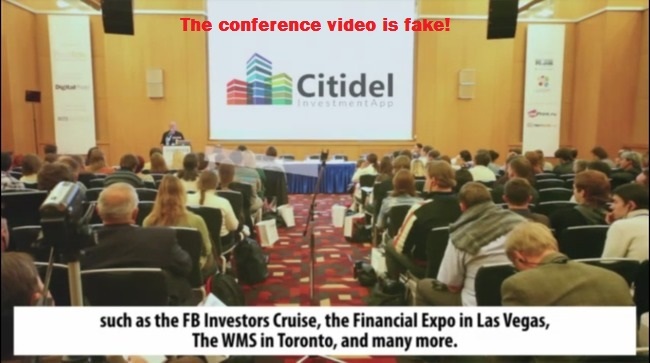 The scammers behind Citidel Investment App scam bought the video, photoshopped their logo into it, and incorporated the footage into the sales video as if Dr. Kent Grifly was giving a talk. The members of Citidel Investment App are fakes, too. Harry Peack was featured as one of the clients of Citidel Investment App within their homepage. You can even look at his earnings for the whole of December 2015. However, this client has been proven to be a fabricated one, too. 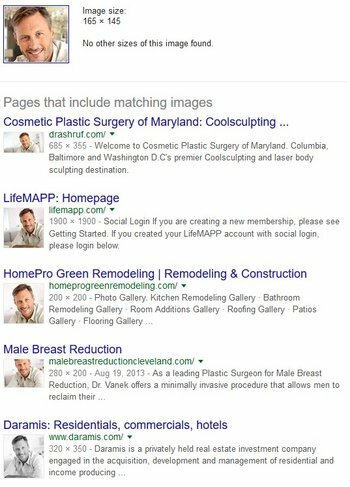 A simply reverse search on the client’s photo will return results from cosmetic plastic surgery, LifeMAPP mentoring network, home remodeling, and even male breast reduction! Is he really involved in all these activities? Of course not. The only reason this photo is appearing everywhere is because it is a stock photo. Just like the stock footage used in Citidel sales video, the photos of its clients are just stock photos that can be purchased online. Multiple companies have purchased the very same photo to be displayed in their websites, which is why the photo is appearing everywhere. I’ve done a reverse check on the photos of the other clients, and all of them turn out to be stock photos, too. Remember that you were promised a free conference pass worth $399 once you register for Citidel Investment App? For the sake of this review, I registered for a broker account with Citidel and did a thorough search once I was inside. Guess what? There is no mention of the conference at all. Take a look at the member’s area page (citidelltd.com/members) for specific information about the conference, such as date, time and venue. Can’t find any? It is to be expected, because there was no conference to begin with. Extra note: Did you notice that you can access the member’s only page without having to give away your email address? You just have to click on the link I’ve provided above and voila, you’re in the “restricted” member’s page! Your email was collected not for the reason of accessing their member’s page, but to be recorded and saved by the scammers so they can send you even more scammy emails in the future. There’s a section called social testimonial within the sales page of Citidel Investment App scam. They show some “live” Facebook and Twitter posts talking about how great the software is. I tried to verify the posts and tweets, and no surprise here – they turn out to be complete fakes too. If you want to try, you can search for the hashtags such as #Citidel in Twitter and see if you can find any of these tweets. 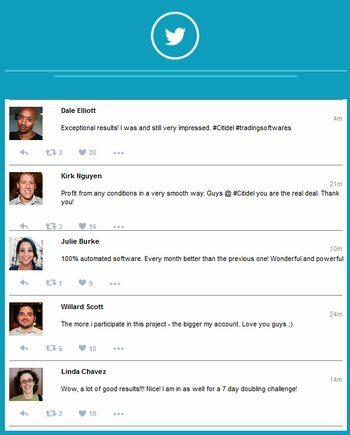 The fake Facebook and Twitter interfaces used in Citidel Investment App scam can easily be done using computer scripts. One way to find out they are fakes is to try clicking on the profile pictures, or trying liking and sharing the posts. The buttons will not respond, because the posts are not real. Now, since pretty much everything in the sales pages of Citidel Investment App are fabricated, can we say the same about the founder, Dr. Kent Grifly and his company? In the sales video, it was mentioned that Dr. Kent Grifly heads an extremely successful company called Grifly Capital LLC, and he’s also the founder of Citidel LTD. Therefore, I’ve done some extensive research on Dr. Kent Grifly and his companies, including reverse photo search and university directories search on Dr. Kent Grifly, as well as business registry and U.S. Securities and Exchange Commissions (SEC) for company filings. The results? Dr. Kent Grifly and his companies do not exist at all. If he heads multi-million companies and gives talks in Financial Expo in Las Vegas (as claimed in the sales video), it’s impossible that there is no information at all about him and his companies on the internet. Citidel LTD is deliberately made similar-sounding to a legitimate investment company by the name of Citadel LTD. Please note that the real company has an “a” instead of “i” in their name. The similarity in names is just the scammers’ way of confusing their potential victims for the legitimate company. Why Are People Still Promoting Citidel? By now, I hope you are convinced that Citidel Investment App is a scam. Just in case you are still having doubts because you have read some positive reviews about the software in other websites, I’m here to put the final nail in the coffin. This may not be the first review you’ve read about the software, and you wonder why are there so many positive reviews out there if this product is a blatant scam. I could’ve written a raving review for Citidel Investment App scam and encouraged my readers to sign up, and I’ll earn a nice $250 commission once they deposit into their trading accounts. In fact, it’s a lot easier to write than to look for evidences and to expose this scam. 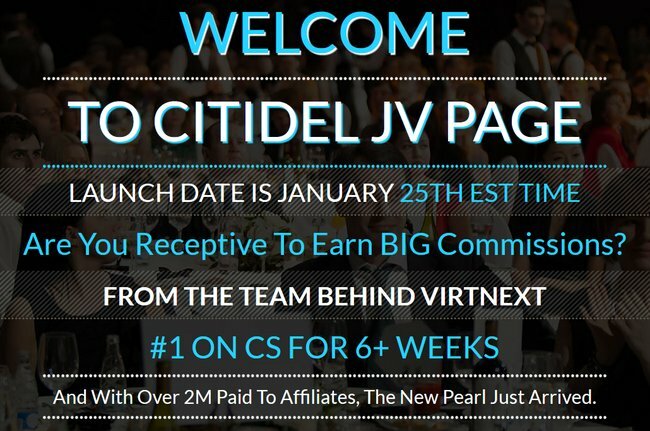 Citidel Investment App, along with Virtnext are some the more successful binary software scams out there because they have managed to generate a lot of fake reviews and misguide its potential victims. YES, CITIDEL INVESTMENT APP IS A SCAM. If you decide to sign up with Citidel, you’ll be required to open a binary options trading account and make a deposit before the software can start trading for you. It is very refreshing to read a genuine review on a scam like this. I am also on a mission to expose scams even if it costs me money and even go against the tide of all these websites who are supposed to expose scams but promoting them to earn cash. My blood is boiling when I see these lies because I have been scammed as well of a hard-earned money just because I was ignorant and wanting to earn extra for emergency reasons. I am willing to share my live result on these auto trading software to help out so email me if you are interested. I am on a mission and I am happy to fight with my allies on this battle against scammers and the websites that promote them.